These discoveries suggest that use of nutritional supplements may be harmful. Omega-3 fatty acids were believed to have a host of positive health effects based on their anti-inflammatory properties, which played a role in the development and growth of many cancers. The investigation at Fred Hutchinson Cancer Research Center makes it clear that omega-3 fatty acids can cause damage to cells and DNA, but their role in immunosuppression is unknown. This study analyzed data and specimens collected from 20 studies with a total of 35,500 participants. In the world of cancer research and treatment, information is king. At Fred Hutchinson Cancer Research Center, researchers are gathering, classifying, deciphering, and translating massive amounts of tumor data into improved outcomes for cancer patients. Fred Hutch’s researchers link a patient’s clinical data with his or her genetic cancer data to thousands of other patients. Ultimately, when someone is diagnosed, a physician will be able to see the cause of the cancer and discover the most effective treatments for the patient. Cancer researchers who are looking for the cause-and-treatment pattern to help them tailor patients’ cancer treatment are stymied by the fact that the information they need is usually scattered among many different databases. A massive database currently under construction at Fred Hutchinson Cancer Research Center will combine clinical records with tumor’s genetic and molecular data with a goal of eventually helping doctors choose the best targeted treatment. Every day researchers at Fred Hutchinson Cancer Research Center are inspired by the hope of finding the next big breakthrough that may lead to cancer cures. These pioneering researchers have dramatically increased survival rates and saved hundreds of thousands of lives across the world. These novel discoveries would not be possible without the newest research tools and equipment. Laboratory supply companies are provided a friendly professional environment at Fred Hutchinson Cancer Research Center to explore possibilities for selling their products and solutions to Fred Hutchinson's researchers. 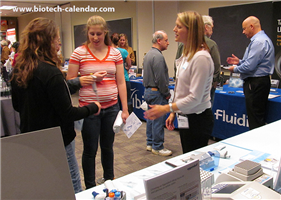 If you are a laboratory supply company interested in looking for an effective scientific branding and research networking opportunity, Biotechnology Calendar, Inc. invites you to the 9th Annual BioResearch Product Faire™ Event on August 19th 2014 to meet face-to-face with your targeted laboratory research audience. 40 were purchasing agents, professors and post docs. These attendees came from 8 different research buildings and 19 on-campus departments. If you are interested in participation of the BioResearch Product Faire™ Event on August 19th 2014, please click the button below for more information. Biotechnology Calendar, Inc. provides more other opportunities at many different institutions to help laboratory supplier connect with academic research across the nation. Please read the National Show Scheduel for 2014 for more information about our other events.